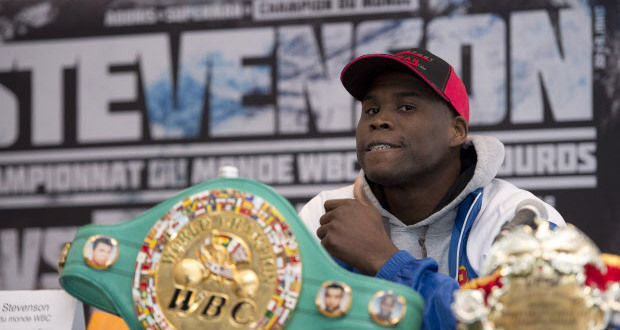 QUEBEC — Adonis Stevenson retained his World Boxing Council light heavyweight title as he stopped Tony Bellew in the sixth round on Saturday night at the Pepsi Colisee. Stevenson (23-1) knocked down Bellew (20-2-1) with a left uppercut. When the Englishman got up, he was stunned with another left followed by a flurry of shots. Bellew was not fighting back, even though he was still on his feet when referee Michael Griffin stopped the bout. It was a second defence for the Montreal fighter since taking the belt with a spectacular first-round KO of Chad Dawson in June. He defended with a seven-round win in September over Tavoris Cloud. Bellew looked to be backing up and avoiding big shots from the power-punching Stevenson in the early round, looking to catch his opponent off guard with sudden attacks. It looked to be working in the fourth, when Bellew had his best moments with some right hand shots over the top. In the co-feature, Sergey Kovalev kept the World Boxing Organization light heavyweight title with a stunning knockout of Ismayl Sillakh only 52 seconds into the second round on Saturday night. After an uneventful opening round, Kovalev dropped 15th-ranked Sillakh with a right early in the second. The Russian was jumping up and down in his corner waiting to get back as the referee gave Sillakh (21-2) an eight-count, then ran up and floored him with another right that ended the bout. “I’m ready to fight any champion,” Kovalev said after his first defence of the belt he won with a four round KO over Nathan Cleverly in August. In his post-fight comments, Stevenson mentioned veteran Bernard Hopkins and English super-middleweight champion Carl Froch as opponents he’d like to face next. There was a spectacular IBF welterweight elimination bout that saw Laval, Que., based Ionut (JoJo) Dan take a split decision over Quebec City favourite Kevin Bizier despite being deducted a point. With the win, Dan takes over the No. 2 ranking and moves closer to a shot at the title currently held by Devon Alexander. It was a close bout between fighters who reply more on technique than power. Dan (32-2) looked to land a few more shots than Bizier (21-1), who appeared to have turned the tide when he hurt his Romanian-born opponent with a right late in the ninth. Bizier was warned twice about throwing Dan to the floor after clinches late in the bout, but it was Dan who then got a point deducted for holding. The first judge gave it to Bizier by 117-110, the next had it 116-111 for Dan and the third scored it 114-113 for Dan. “I think the ref gave him the point too easily,” said Dan. “I didn’t do nothing. A battle of knockout artists had the crowd on its feet as David Lemieux (31-2), a ranked middleweight from Laval, knocked hard-headed Colombian Jose Miguel Torres (27-6) down seven times before the scheduled 10-round bout was stopped by the referee 1:48 into the seventh. Torres was floored twice in the second round, again in the fourth, and twice more in the sixth and seventh before he finally stayed down after a crushing right from Lemieux. Welterweight Mikael Zewski (22-0) of Trois-Rivieres, Que. stopped 35-year-old Ryan Lee Davis (24-12-3) with three knockdowns in the third round, one on a liver shot, of their scheduled eight-round bout. Montreal-based Russian light heavyweight Artur Beterbiev (3-0) stung William Ray Bailey (12-18) with a jab and finished him with a short right to the temple only 2:49 into their scheduled six-rounder. The 2009 world amateur champion has needed only six rounds to win his three pro fights. The crowd roared as local 32-year-old heavyweight Eric Martel Bohoeli (10-3) knocked down Didier Bence (9-1) of Montreal twice en route to a stoppage at 1:44 of the second round of their eight rounder. Local favourite Sebastien Bouchard (8-0) won all six rounds against slow, light-hitting Belgian middleweight Mohammed Sidi Slimani (4-2).